Ring News 24Boxing History Breaking Boxing News OtherCan Fighting Past Your Prime Ruin Your Legacy? Joe Louis. Roy Jones Jr. Muhammad Ali. Evander Holyfield. Ray Leonard. The list goes on and on. They have all done it. Boxing can be a hard sport to give up when a fighter has been partaking in the sport since he was a young teenage boy. It has often been said by boxers that fighting is in their blood. That statement could not be very far from the truth if history is anything to go by. But can it ruin one’s legacy when one still competes long after the days when their reflexes did not betray them and their tremendous punch resistance saved them from many edgy moments? An incentive that we hear a little too often for a boxer to fight on for longer than he really should is that he experiences financial hardship. Many warriors of the squared circle grow up not really knowing what it is like to endure stability in that area. And going from struggling to making a few bucks working on the streets as an impoverished child to holding a cheque for $10,000,000 or more is most likely overwhelming. And of course, the huge spending usually follows and before they know it they find themselves in almost familiar territory. And fighting then seems to be the only way out! 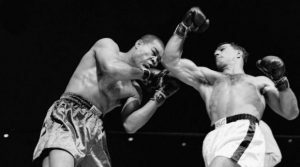 An over the hill Joe Louis is seen here getting beat by Rocky Marciano. Louis allegedly returned to boxing for financial reasons. But if we fast forward a little to when all is done and using myself as an example, do I find myself thinking about Muhammad Ali’s heart wrenching beating at the hands of Larry Holmes or a past his prime Evander Holyfield struggling with the likes of Sherman Williams? This is most often not the case. Discussions are often seen taking place online travelling down memory lane talking about Muhammad Ali’s battles with George Foreman and Sonny Liston, and any mentions of the likes of the Holmes or Trevor Berbick fights are briefly touched upon to emphasise how poorly the three time heavyweight champion looked but never that it impacts any of the achievements he made earlier in his career. The fans do, from time to time, like to think that if a particular boxer is still competing past his prime that he will ruin his status as a legend of the sport and then can only bring themselves to look back at some of his greatest moments of yester year. It is as if hindsight makes us eventually realise that the final chapter is often irrelevant, especially if that chapter is only being written because it was forced to. A kind of mutual understanding takes place between the boxer and the devotee, at least on a more spiritual level. There have been moments when a boxer has fought in his prime and has risked ruining his legacy. Take Roberto Duran quitting against Sugar Ray Leonard in their November 1980 rematch. Or Naseem Hamed retiring almost after he was taken apart by Marco Antonio Barrera. 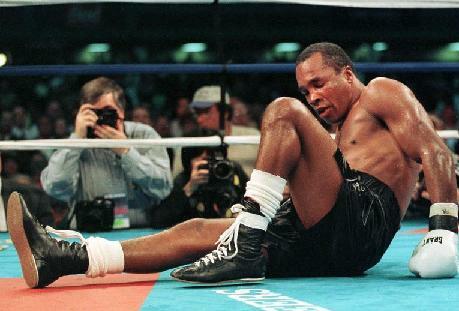 Then there is Lennox Lewis retiring after his war with Vitali Klitschko. All three of them examples still provoke heated debates today as to whether those moments have dented their legacies. It is now considered that Lewis was coming to the end of his prime, but at the time there was little thought of this. 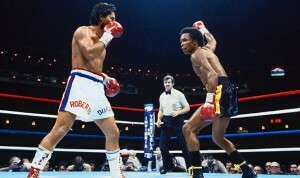 Sugar Ray Leonard taunts Roberto Duran in their rematch. Duran quit shortly afterward which has caused many to think whether that should affect his status as one of boxing’s legendary boxers. It goes to show that, while there will probably always be concern as to whether a boxer will damage his standing by outstaying his welcome, knowledgeable fans are not naive or disrespectful enough to simply sweep aside the most cherished moments of their careers for the sake of wanting to experience glory one more time or using their boxing licence to put bread on the table. Everybody has to do what they have, or want to do. And that is okay.